I finally saw the documentary, An Honest Liar, about James “The Amazing” Randi over the weekend. I was at The Amazing Meet!ng (TAM!) in Las Vegas last July, when the movie first debuted, but I didn’t get a ticket. About a year before that I enthusiastically contributed to the Kickstarter campaign to help get the movie funded. 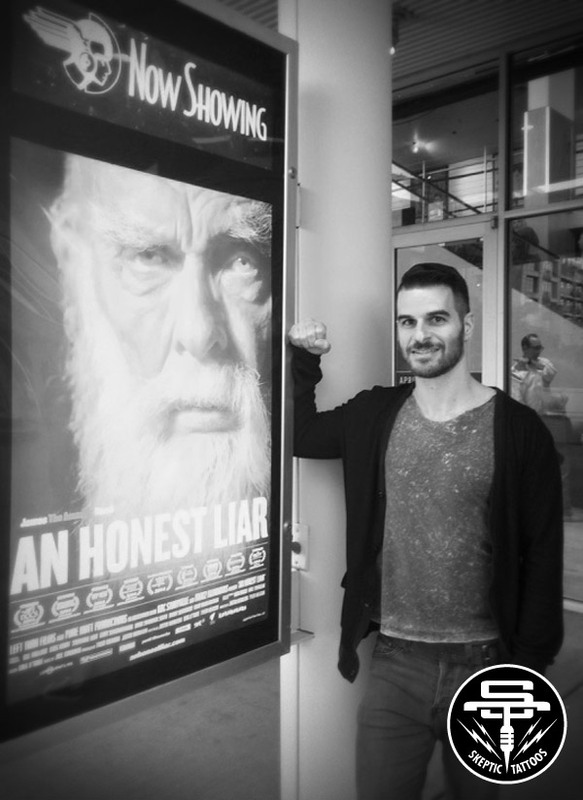 An Honest Liar is currently touring the country and this week it was in Dallas, so I grabbed my mother (dating in Dallas has been pretty fruitless), bought a couple of tickets and headed to the Angelika Theater to take it in. I’d been waiting a long time to see it! Arlo at the Angelika Theater to see An Honest Liar. We showed up for an evening showing on Friday night, the first night it was at the theater. The Angelika was abuzz with activity. There were photographers and videographers staged outside doing interviews and taking photos. Throngs of moviegoers were moving in and out of the theater, getting drinks and socializing. What was going on? It turns out that An Honest Liar opened in Dallas the same night as the Dallas International Film Festival. An Honest Liar wasn’t a part of the festival, it just happened to be at the same theater. It can be difficult to spot, let alone meet, other Skeptics in real life, so I was excited about the opportunity to see who might show up to see An Honest Liar. Unfortunately, thanks to the film festival, most of the attendees that night were most assuredly not there to see An Honest Liar and because there were so many of them it was near impossible to single out anyone who might have been. It wasn’t until my mother and I actually got into theater 2, where An Honest Liar was showing, that I was able to see who had turned out for the film. All of the other theaters had huge lines waiting to get in, presumably they were all a part of the film festival, theater 2 had, maybe, a couple dozen people inside. In fairness, this was not An Honest Liar’s first stop through Dallas. A screening had been arranged several months before, in October 2014 (before my move to Dallas), so it is likely many people would have seen it then, also, the Angelika Theater was screening the movie for an entire week, with multiple show times, so the viewership might, as expected, be spread out. Still, compared to the activity that was being generated by the International Film Festival it was a little disappointing. It turns out the trailer was for some bloated looking film starring Russell Crowe looking for his sons after World War I, called The Water Diviner. What were the chances! Of all of the films, in all of the world, of all of the films ever created, how did it end up that the fates of these two disparate films would converge for this screening? An Honest Liar is a film chronicling a man whose entire life has been devoted to exposing frauds and people misguided by unscientific thinking and The Water Diviner, incredibly, appeared to be not only based on, but named for, that practice of water divining (or water dowsing), that has been so thoroughly debunked -- by no less than James Randi himself (among many others) -- that it practically serves as the case study for how to test and expose spurious claims. 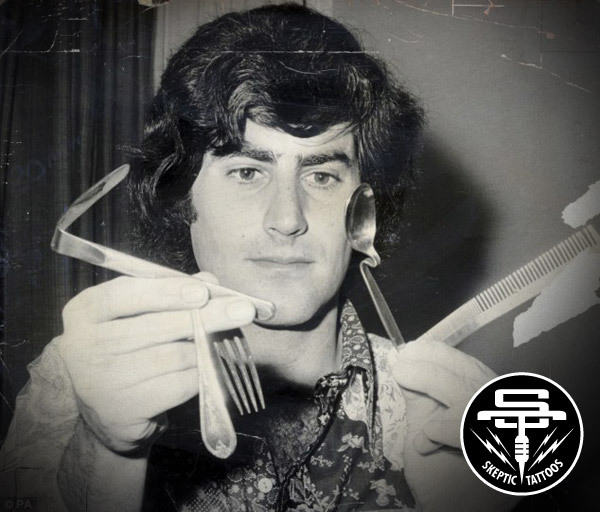 Spoon bender to the stars, Uri Geller. I am familiar with Randi’s career and was somewhat familiar with most of the capers chronicled in the film, which were essentially Randi’s greatest hits, including: his rivalry with spoon bender Uri Geller, his exposure of the televangelist Peter Popoff, his meddling with the scientists of Project Alpha and the new age spiritualist sting, “The Carlos Hoax.” Even so, it was interesting to see how well documented everything was and to hear the stories from the actual players involved, including Uri Geller! My mother and I both liked the movie. I liked it a lot, despite already being familiar with much of the story and my mother liked it a lot despite not being very familiar with any of the story. It is a testament to the filmmakers that they created a film that works just as well for both audiences. The storytelling and film making were very satisfying. As a Skeptic I am always looking for things that might represent the movement well to outsiders and An Honest Liar was up to the task. The film was artfully and thoughtfully crafted. 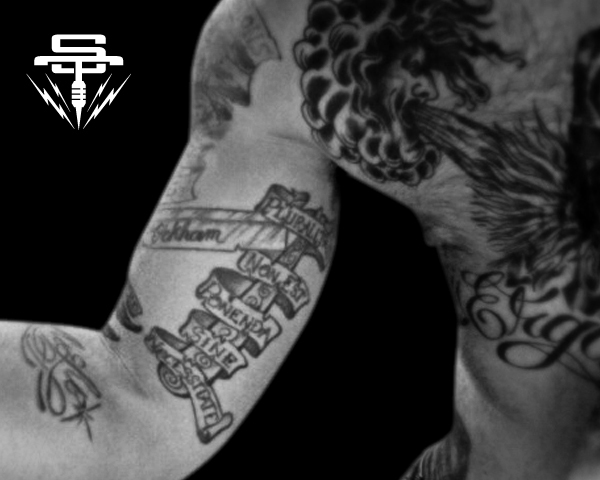 It was professionally and stylishly produced. The editing was polished, the story arc was compelling and the twists and turns, even to someone familiar with the story, were captivating and sometimes surprising. I already had a lot of respect for Randi and his career, but the way the film humanized Randi is what I found most surprising. Randi has been performing his entire life, since running away with the carnival at age 17, and sometimes you get the sense that all Randi is ever doing is performing. In every interview and in every media appearance, even behind the scenes, Randi is always “on.” He is always prepared with a quip, always doing a shtick and it gives the sense that perhaps there is no person there other than “The Amazing” Randi. Perhaps he has been performing and cultivating his stage persona for so long that the stage persona is all that exists anymore. So, it was the moments in the film that captured Randi with his guard down, not as “The Amazing” Randi, but just as a man, honest, frail and vulnerable that were the most moving. It was those glimpses of the person behind the persona that made me like both even more. Randi is 85 years old and in declining health. He has been a tireless advocate for Skepticism and reason for many decades and he is only now finally starting to show signs of wear. It is not certain how many more TAM!s Randi will be able to attend, but it is clear now, perhaps more than ever, that Randi's is indeed a life worth celebrating. Tattoo of James "The Amazing" Randi on Steven Powers. Find showtimes for An Honest Liar in your area. Watch the trailer for An Honest Liar. Register for The Amaz!ng Meeting. See a gallery of tattoos inspired by James Randi.